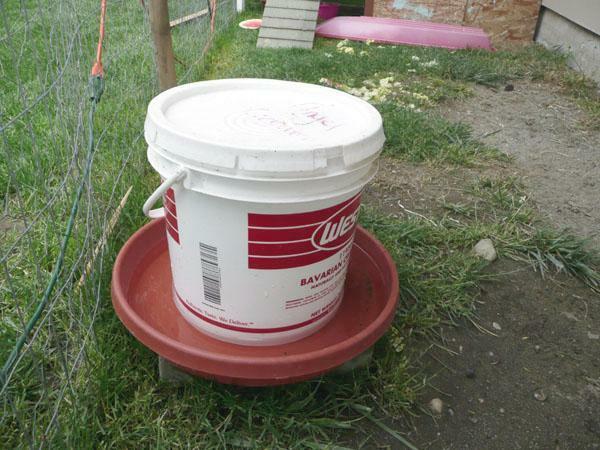 Waterer made from a 4 gallon bucket free from a donut shop and a 20" plastic planter base. Simple to make, just make sure your lid has a good seal, this lid has a rubber gasket that makes for a great seal. It wont work with an ordinary lid. Simply drill one 1/2" hole an inch or two off the bottom of the bucket, make sure it is lower than the rim of the planter base. Bolt/screw the bucket to the base and thats it. One hole is enough you don't need a bunch, one keeps the water in the bucket cleaner and makes it easy to fill. While filling all you need to do is cover the hole with your finger untill you have the lid secured, otherwise you will just overflow the base. No filling and flipping like some. 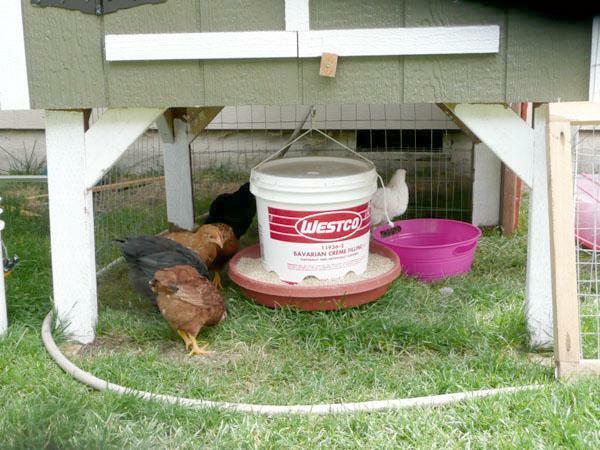 Feeder made the same as the waterer, only the lid doesnt need a rubber seal. Just drill a series of 1 3/4" holes around the bottom of the bucket, my bucket had small plastic tabs around the circumference of the bottom that made it easy to evenly space my holes. Bolt it to a 20" plastic planter base and it's done. Cost for both was about $12 for 2 planter bases and the buckets were free. If i was doing it over i wouldn't change a thing, works perfectly. "Budget DIY Feeder & Waterer"
A couple of good ideas on how to make a feeder & waterer using ordinary materials. Nice use of a Donut shop bucket! Nice description of easy to make feeder/waterer. Nice & simple design for not a lot of money. You can also look at the Gamma lids which screw on. I think they are $6-8 at Lowes. the lowe's ones or home dept ones are around $5 for bucket and lid. The easiest solution is go to Home Depot and purchase one of their 5 gallon orange buckets and the lid that goes with it. It's easy to remove. I used this for my waterer project and it works GREAT! Today, I'm working on making an extra feeder using this same idea. I cannot remember the cost of the bucket, but it was well worth it. Perhaps a rubber sink stopper? Drill a hole in the lid and put the sink stopper in the hole, pull it out when you need to fill? I totally hear you about them tough lids. My husband is a drywall taper and those empty white mud buckets are really hard for this gal to pry open. Love the ideas... well done..
Great ideas - I am now going to start searching for buckets so we can try this at home! Works nice! thanks for the idea. We used a bucket we got from walmart bakery, the bottom of an old plastic tub(from walmart several years ago for $5). My only problem is that I can't get the darn lids off so made one for the feeder and just didnt seal the lid. I like to post a pic but I can't figure out how to do it in this section. we are still working on the waterer idea, i think my husband is going to try and put a plug in the lid that I can remove the cap and fill then replace the cap. thanks for this "how to"